Ski boots are one of the most important parts of your equipment, not only are they very functional, they also affect your comfort more than any other part of your ski equipment. If your ski boots are really uncomfortable, it doesn't matter if the rest of your equipment is perfect for you, you still aren't going to enjoy your day anything like you could do. Ski boots are designed to transfer your movements into your skis, while supporting and protecting your feet, ankles, and lower legs. In order for the boots to transfer forces well, they have to be stiff and restrict the movement in your ankles. This stiffness and lack of movement makes it a lot harder to walk in ski boots than normal shoes. Also, because ski boots are stiff, tight, and restricting, this can make badly fitted ski boots very uncomfortable. 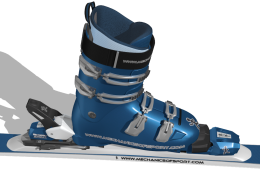 It is important to find the right boot for you and to have the ski boots fitted properly. Even good fitting ski boots can be uncomfortable if you haven't used them recently, because of the pressure they put on your feet and legs. 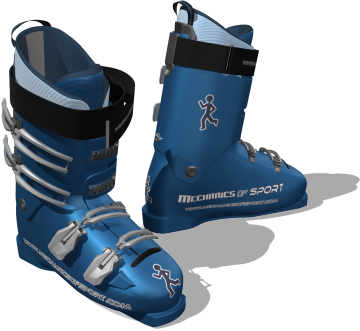 The soles on ski boots are designed to attach to ski bindings so that the boots can be held firmly onto your skis. To ensure any alpine ski boot can be used with any alpine ski binding, ski boot soles adhere to the ISO 5355 design standard. This ensures the shape of the lips and overall dimensions of the ski boot sole are within set limits and will work in any alpine ski binding. Some of the parts, features, and properties ski boots can have are listed below. 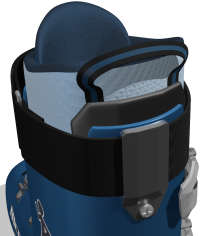 The shell is the solid outer layer of the ski boot, and is made of two parts, the lower shell and the cuff. The lower shell is the part where your foot is contained, and the cuff is the part that goes around your shin and lower leg. Shells are made of polymer plastics, often Polyurethane or Polyether. It's common for the shell to be made of 2 or 3 different types or densities of plastic, so that different areas of the shell can be optimised to affect strength, stiffness, flex, comfort and ease of putting the boot on and off. 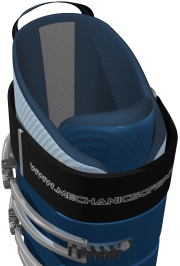 The shell's job is to be the outer exoskeleton of the ski boot, holding everything together, attaching to the ski binding, and providing the strength and stiffness. 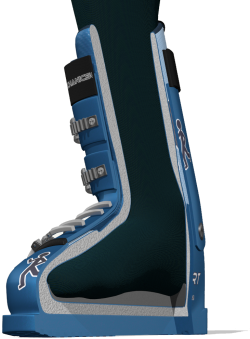 The flex of a ski boot is a measurement of how stiff the ski boot is, and how hard it will be to flex your ankle while in the boots. Manufacturers usually assign each boot a value for flex on a scale between about 50 and 140, where 50 is very soft, and 140 is extremely stiff. There is no set scale that manufacturers use though, so a 100 flex boot from one manufacturer is not necessarily the same as a 100 flex boot from a different manufacturer. Because of this, although flex ratings can still be used as a guide between different manufacturers, they are most useful for comparing the stiffness of ski boots from the same manufacturer. Beginner and lower intermediate skiers usually go for softer flex boots, that are more comfortable and more forgiving, whereas expert skiers and racers go for very stiff boots, which are very responsive and efficient, but lack the same comfort and warmth. Most intermediate and advanced skiers go for ski boots with a medium to hard flex, tailored to provide the performance they need, without being overly responsive, or sacrificing too much comfort or warmth. Below is a chart showing roughly how the flex of ski boots matches skiing preferences and ability levels. As women are generally smaller than men, they often require a boot with a flex up to 20 less than the values shown on the chart above. Also men or women who are lighter or heavier than average, may want to go for a slightly softer or harder flex. Some boots also offer the ability to adjust the flex of the boot slightly, so that you can better tune the boot to what you want to do. This is normally adjusted by a bolt on the back of the boot. The shape of the shell can have a large effect on how comfortable a ski boot is. 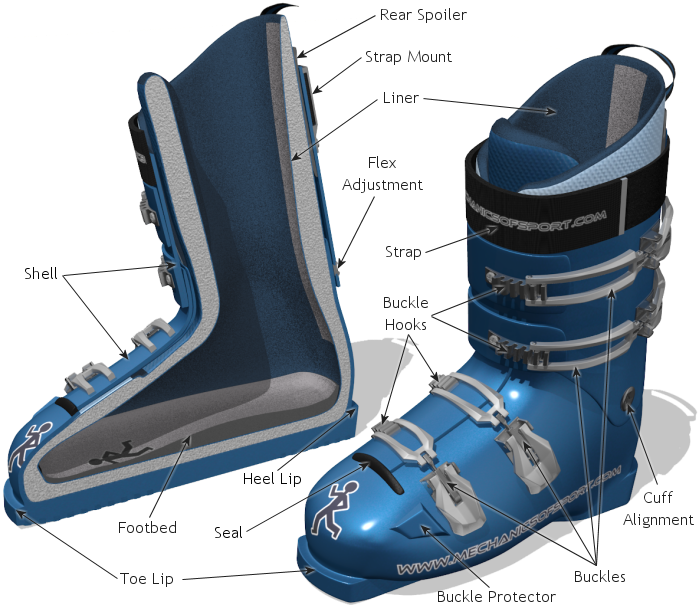 Because of this most shells can have their shape changed in several ways to customise the ski boot to a person's foot. For a long time shells have been able to have areas heated up a pushed out with a press to adjust their shape, but there are some newer technologies now available that are a lot quicker and easier. This is where areas of heat moldable plastic are built into the shell, normally along the sides of the foot. The boot shells are heated up in a special oven, until they are at the right temperature (normally about 80°C), then they are taken out of the oven and the liners are put back in them. 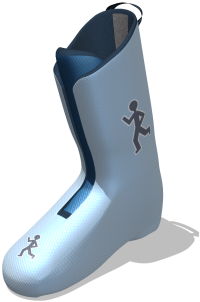 The skier then puts the boots on, and with just the pressure of the skier's foot inside the boot, the heat moldable areas expand to fit the skier's foot shape. The shell is then cooled down to set the plastic, so that the shape will not change any further. This is a quick and effective way to shape key areas of a boot to a skier's foot, but the heat moldable areas will only expand by up to 5 or 6mm, so it still might not solve all problems for people with very abnormally shaped feet. 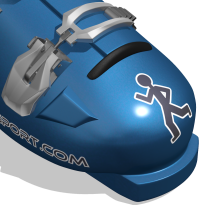 A more recent development is to mold the entire shell to a skier's foot, instead of just a few key areas. Boots that can do this have shells that are made entirely from a moldable plastic, so that the whole shell can change shape. The process currently used to do this is roughly the same as with moldable areas, except instead of using the skier's foot to push the shell outwards into the right shape, the boot is put into an inflatable cast that pushes the boot onto the foot and leg. 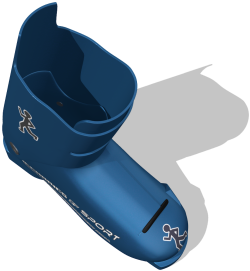 This enables all areas of the boot's shell to change shape and better fit the user's foot and leg, although again the plastic will only move up to 5 or 6mm. All ski boots tilt the lower leg forward, so that your ankles and knees are bent when you stand in ski boots. Forward lean is normally set at about 14° but can often be adjusted as far as 17°. The cuff of the boot will not let your ankle move sideways, or let you straighten your ankle, but the flex of the boot will enable your shin to move further forwards by a few more degrees. The forward lean and stiffness of ski boots makes walking in them more difficult than in normal shoes. Because of this, some ski boots, generally boots aimed at lower intermediate skiers, have a mode that makes it easier to walk in the boots. Exactly what these modes do changes between different boots, but they normally free up the cuff to rotate forwards more easily, and often let the cuff come further backwards than normal. Although these modes don't solve the walking problem completely, they can make ski boots much easier to walk in. 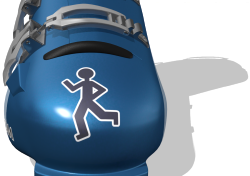 Walk modes are normally activated by a lever on the back of the boot, but some boots even have walk mode activated automatically when the boot is not clamped in a ski binding. There used to be a few different types of ski boot around, but these days almost all ski boots you can buy in the shops are "front entry", where the shell wraps over itself in front of the shin and over the top of the foot. To get your feet in and out of the boots, the buckles are undone and the overlapping areas are pulled apart to create the extra space needed. Older styles include "rear entry" boots, where the back of the boot hinges backwards to let the foot in and out of the boot. The liner is the soft boot layer that sits inside the shell, and lies next to your foot. Like shells, liners can also vary a lot, below are some of the features and properties to look for in liners. How thick the liner is can effect how responsive, comfortable and warm a ski boot is. Thicker liners are better for comfort, and keeping your feet warm, whereas thinner liners are better for power transmission, and are generally not as warm or comfortable. Thicker liners are normally found on boots aimed at beginners and intermediates, with thinner liners found in boots aimed at racers, or expert skiers. Most intermediate and advanced boots have liner thicknesses that suit their flex, to create the right combination of performance and comfort. Most liners these days contain heat activated materials that will mold to the contours and bumps of your foot. The amount, thickness and placement of this material can vary a lot between liners, depending on what the liner is intended for. To mold the liners, hot air is normally blown into the liners to heat them up, and then the ski boots are put on for 5 to 10 minutes for the liner to adjust to the shape of your feet and ankles. A heat molded liner together with a custom insole, and if needed, a molded shell, can give your boots a very precise and comfortable fit. Another method that some aftermarket liners use to create a custom fit, is to inject foam into the liner walls while your foot is inside. However, due to the improvements in shell molding and normal liner heat molding, this type of liner is not as common as it used to be. A lot of liners have smooth slide areas along the back of the leg and heel. This is to make the boot easier to put on and take off, by letting the heel slide along the back of the boot more easily. 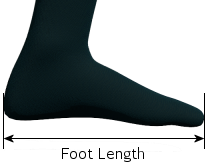 It's becoming common for manufacturers to put neoprene around the toe area on liners, so that the area is able to stretch a bit and improve comfort. Some race orientated ski boots are so stiff that their liners have been designed so that you can take them out of the shells and walk around in them during your lunch break. The insole, or footbed, is the platform that sits under and supports your foot. One recommendation often made when buying ski boots is to replace the insoles they come with, with either a custom insole, or higher quality aftermarket insole. Supporting the contours of your foot is very important for comfort and power transmission, yet the insoles that come with ski boots often don't provide much support, which is why it is generally recommended to replace them. Custom insoles are insoles that are specially shaped for your feet. There are a few ways this can be done, some methods take a mold of your feet, and use this to mold the footbed, whereas others take a 3D scan of your foot and carve the footbed from a solid piece of EVA plastic. Custom insoles provide the closest fitting, best supporting and most comfortable insoles possible, but as usual this kind of quality does come at extra expense. Heated insoles contain heating elements inside them, which can be connected to a battery and used to help keep your feet warm while you are on the mountain. For people who easily suffer from cold feet, this can be an important extra to have, as it can increase their comfort through the day immensely. Heated insoles can be bought as aftermarket insoles, or can be made by having the heat elements added to a custom footbed. A more recent technology to hit the market is heated socks, which can take away the need for heated insoles, and ensure your feet stay warm not only in your ski boots, but also in any other shoes where your feet might get cold. Buckles are the latches that hold your ski boots closed, and determine how tight your boots are. Traditionally ski boots have 4 buckles, 2 over the foot, and 2 around the shin, which many of today's ski boots still have. It is becoming more and more common however for boots intended more for hiking, freestyle, or comfort to have only 3 or even 2 buckles. Although the style of buckle can change between boots and manufacturers, the systems used normally involve an arm that reaches over and catches onto one of several hooks, which is then pulled tight and latched into position. The position of the hooks can often be changed for people who have very narrow or wide lower legs. The length of the buckles on most boots can be fine tuned by rotating the buckle arms. Turning the arms clockwise or anticlockwise will normally make the arm about 1mm shorter or longer for each revolution. This means the tightness of the buckle when it is closed can be adjusted to within about a millimetre instead of the much larger distance between the fastening hooks. It's becoming common for boots that are not aimed at racers or expert skiers to use less than the normal 4 buckles. When 2 buckles are replaced by one buckle the manufacturer normally uses an oversized buckle for extra strength and support. On some boots the position where the instep buckle attaches to the shell can be moved. This allows the foot hold from this buckle to be adjusted to your preference. Around the top of the boot there is normally a velcro strap that helps tighten the top of the boot around your leg. 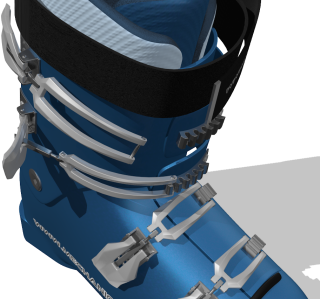 This adds another layer of adjustability and performance to the fit of the ski boot. Often stiffer boots have a wider strap than softer boots so that the upper leg is better supported. The straps on some boots use systems to make it easier to get the strap tight, and others have even replaced the velcro fastening with other mechanisms. The rear spoiler is a plate that goes between the liner and the shell at the back of the boot where the calf muscle starts. This plate can be moved up and down to increase or decrease rear support, and to suit the shape of the skier's leg. The seal is a strip of rubber that sits above the toes in front of where the overlap in the shell starts. It is there to block any gaps in the shell created by the overlap, and to stop snow or water getting into the boot. Cuff alignment (sometimes refered to as canting) allows the sideways angle of the cuff to be adjusted to suit the skier's lower leg shape. For people with a knock kneed stance the cuff needs to be tilted inwards, and for people with a bow legged stance the cuff needs to be tilted outwards. Most boots offer about 1 degree of movement in each direction. Adjusting this allows the boot sole (and therefore the skis) to sit completely flat on the ground in your neutral stance, as it should be. Cuff alignment is normally adjusted through bolts on the outside of the ankles. Walking on hard surfaces can wear down the toe and heel sections of ski boots. Because of this many ski boots have areas of the sole that are able to be replaced once they have been worn down. 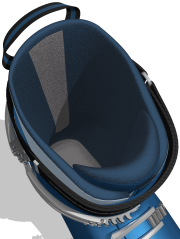 In the footboard of the shell, different materials can be included to help reduce the shocks and vibrations that are transferred into the foot. Women's legs are shaped differently to men's legs. Their calve muscles are shorter and lower, with a greater variation in size, and their ankles are thinner. It's also more common for women to have a knock kneed stance. Women specific ski boots take these differences into consideration with shapes, moldable areas, and adjustments suited to women. Often the plastics used are also softer and the liners warmer. Below is an overview of some of the things to be aware of when having ski boots fitted, and if required, customised. Trying on and fitting ski boots can be a long and complicated process requiring the expertise of a boot fitter, here only the basics of how things can differ are explained, without going into precise detail. 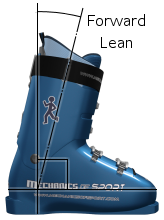 Ski boots use their own sizing system called Mondopoint. Your mondopoint size is quite simply the length of your foot in centimetres (cm), most shops have a foot measuring device which will measure your mondopoint size. Mondopoint sizes go up in half sizes, i.e. 26.0, 26.5, 27.0, 27.5, etc. The difference between a whole size and a half size is not the length of the foot however, it is the width of the foot. Whole sizes are for narrower feet, and half sizes are for wider feet, but they are both the same length. Measuring devices will normally measure your foot width as well, to advise you to whether you need a narrow or wide boot for your mondo size. Mondopoint sizes are also rounded down, meaning if your foot is 26.8cm long your mondo size is 26, it is not rounded to the nearest whole number. Using a device to measure your foot does not guarantee that is the size boot you will want, it is just a guide. In order to find the right size boot for you, you will still need to try on a few different size ski boots. Last is the skiing term used to describe foot shape. It used to be that each manufacturer made boots that suited a different shape of foot, e.g. narrow, wide, high volume, low volume, etc. This is generally not true any more, with most manufacturers now having several different boot models that suit different foot shapes. You do still need to find the models of boot that are best for your foot shape however. Your ski boot sole length does not affect the fit of your ski boot, but it does affect your ski bindings. The toe and heel sections of the boot are made to set dimensions, but the distance between them can change. The overall length of the ski boot sole is what your ski binding needs to be set for, so that your boot will be held correctly by the binding. The length of the sole is normally written on the boot, somewhere on the side of the sole, with a measurement in millimetres (mm). Your bindings should be adjusted for your boots by a technician in a shop. Wedges can be stuck to the footboard underneath the liner to improve things like ankle alignment. Areas of the shell can be heated up and pushed out with a press, to decrease pressure points or make space for things like bunions. Foam pads can be added to the outside of the liner to increase things like ankle hold, or to soften the pressure on certain areas when the shell is also stretched locally. Canting is where the angle that the whole ski boot sits on the ski is changed. 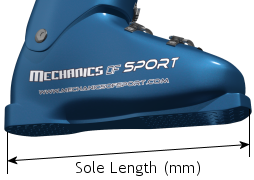 This can be done by putting wedges under the ski binding, or by planing and rebuilding the sole of the ski boot. Canting should not be played with though, and should be left to the ski boot experts. Canting and cuff alignment are often confused, especially as different manufactures use the terms for different things. Rubber grips can be put over the soles of ski boots when you are not skiing. These stop the heel and toe wearing down as quickly, make walking in ski boots slightly softer, and can increase your grip on snow, ice and tarmac. Ski boots require relatively little maintenance other than making sure they dry out after being used. It is important to let boots dry out after a days skiing, as a wet or damp ski boot will be less comfortable and will let your feet get cold a lot more quickly than a dry ski boot. If a boot is left damp for too long or too often, areas of the boot can become mouldy. Mould generally doesn't damage ski boots, but it can leave them in a less than desirable condition. Other maintenance that might need to be done occasionally is replacing the heel and toe sections if they are worn down, or replacing buckles if they get damaged. 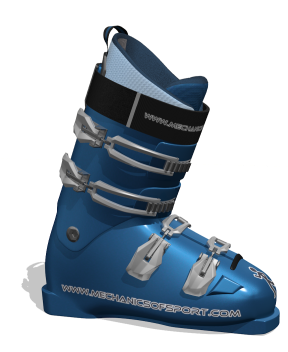 The information here is for alpine ski boots, there are other types of ski boot for different types of skiing which can be quite different. Other types of boot include touring ski boots, telemark ski boots, and cross country ski boots. On to the the Ski Poles section.